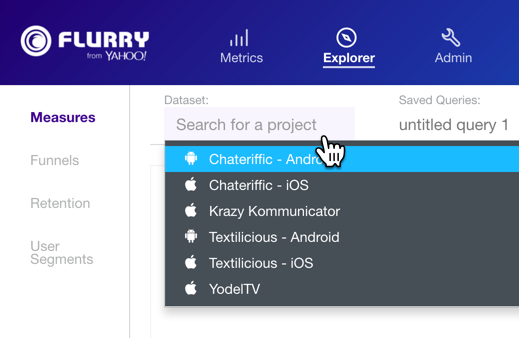 Flurry Explorer is designed and implemented as a powerful, yet easy-to-use analytics tool for running general and custom queries based on the dataset of your app. You can build and execute queries more flexibly and with greater ease, returning answers in graphical and numeric form to those queries almost immediately. To get started, you’ll need to be a registered Flurry developer who has downloaded and integrated the Flurry SDK into your app. There are no coding or programming prerequisites to work successfully with Explorer. No separate Explorer SDK for iOS or Android is required. The Flurry Analytics SDK will continue to capture all of your app data, and then a portion of that data is ingested into Explorer for use in this new tool. Log in to Flurry Analytics. Click the Explorer item in the header to navigate to the Explorer section of the site. Select the app you want to Explore from the Dataset dropdown menu. You will notice many items in the left-navigation, with the first three representing a different type of analysis you can perform with Explorer: Measures, Funnels and Retention. Other options available include User Segments providing a fast way to segment your users, User Paths allowing you to see the different paths that users take through your app, and User Journeys giving you the ability to review individual actions that a user takes within your app on their device. In each case, Explorer provides you with a powerful set of building blocks for your query. For Measure queries, you can specify Metrics, Dimensions and Filters. For funnels, you can define funnel Types, Steps, Dimensions and Filters. And in the case of retention, you can show users who first performed an app install, and then the steps they followed to complete the install, in addition to specifying dimensions, like User Region, and filters, like Session Date/Time. How to build & execute queries for analysis of measures. How to build & execute queries for analysis of funnels. How to build & execute queries for analysis of retention.